The Sweetest Valentine's Packages at Shear Madness! Me and My Bestie Valentines Packages! Offers will vary by location so please check with your store! BOOK AHEAD! By appointment ONLY! DIVA DAY or Madtastic Manes Gift Certificates - GET FREE SHIPPING in February!!! Available for purchase in all our stores each darling gift certificate comes with a cute gift envelope! Our Diva Day gift certificate buys One Diva Day Makeover includes sparkly hairdo, glittery makeup, and mini manicure PLUS $10 of retail. Our Mad Manes gift certificate buys One Madtastic Haircut with colored hair stripes PLUS $10 of retail. These make the perfect gift for any Diva or Dane!! Our favorite this month on Pinterest! 10 FUN DIY Valentines for Kiddos! Are you or someone you know interested in opening a Shear Madness? Now is the time!!! Get more info on our franchise website! We're having a great day at Shear Madness, you have one too! Our Holiday Toy Drive Begins! Spend $50 or More in retail and get an additional retail item at 40% off to donate towards Toys for Tots! Donation bins will be located in our stores during the months of November and December. Please call your store for details. Thank you for your generous donations! We Have the Rainbow Loom Bracelets! These extremely popular DIY rubber band kits are the creative kid's DREAM and we have them at Shear Madness!!! Shop for these great gifts and other fabulous finds in our award winning Youniquey Boutiquey! On Thanksgiving Day all of our stores will be CLOSED. The NEW Shear Madness has opened it's doors in Albuquerque NM! Specializing in kid's haircuts, boutique retail, and fabulous birthday parties! Come check us out and be sure to join the model search on facebook! Coming SOON to West Des Moines!! The next Shear Madness is set to open in West Des Moines IA! Located across from Jordan Creek Mall, stay tuned for exciting details to come! Check out this month's COUPONS! Tons of fun recipes, cartoons, and things to make you smile on our new holiday Funny Board. Follow us on Pinterest for lots of great stuff! What's the most musical part of a turkey? Why did the turkey cross the road twice? #shearmadnesskids is now on Instagram too! Ever Thought of Owning your Own Business? Are you or someone you know interested in opening a Shear Madness? Now is the time to get more info on our franchise website. Congratulations to our Free Haircut Friday Winners! Our winners for October were : Melissa Selock, Michelle Audo, Kim Fallon, and Janelle Squire! Look for our Free Haircut Friday contest every Friday on our facebook page. It's a Princess SALE! Get 20% off ALL Princess and Dressup Items this month! Save on Fairy Wings, Princess Wands, Tiaras, Tutus, and EVERYTHING Princess! Retail varies slightly, call your store for details. Saturday, October 26 thru Thursday October 31st - We will have a DIY Nail Station set up in all our salons to decorate your digits for FREE! Come in and have some fun decorating your nails at the Nail Art Station! We'll offer COLORED HAIR STRIPES on October 31st for anyone who wants with the purchase of a haircut!!! To celebrate at Shear Madness schedule an appointment with your Mad Stylintist today! We will be setting up toy donation bins in our stores as part of the Toys for Tots Annual Toy Drive. During the months of November and December when you buy $50 in retail or more then we will give you 40% off any retail item you wish to donate to Toys for Tots! Or you can bring in NEW toys to donate and place those in one of the bins! Thank you SO MUCH for your generous contribution and helping to make this holiday season a special one for so many kids! West Des Moines, IA Opening Mid November! San Antonio, TX at The Forum! NOW OPEN! Enter the San Antonio and Albuquerque NM Kid's Model Search on Facebook and you could be one of 10 winners chosen in your city! Are you or someone you know interested in opening a Shear Madness? Now is the time to get more info on our franchise website! Our Winners for September were : Emily Lorenz, Stacie George, Crystal Feldhaus, Abbey White Robinson, and Kelly Shephard Smith! Look for our Free Haircut Friday contest every Friday on our facebook page. It's just about that time.. a NEW school year is right around the corner! Moms and Dads prepare yourselves, you're little ones are getting bigger. If you're anything like me you'll probably start shopping early for the best deals on back to school paraphanelia! Cool new backpack, check. New shoes, check. A shiny little pencil box with new tools, a rock star outfit, and something for teacher - check check check! Just one more thing though.. What about a new hairstyle!? Summer is over and messy pool hair stay up late don't comb hair unless absolutely have to days are OVER! So, what's this cool new do gonna be?? Can you find just the right hair accessory to match her outfit? Spikes are still in for fall of 2013 and so are bobs with blunt bangs! For sure these styles look great with straight hair. Try our Bouncy Creme to give shape and hold to curls or simply put a (BIG) bow on top. Watch out mom, these looks are gonna charm the teacher. Shear Madness Haircuts for Kids children's salon specilaizes in COOL haircuts for kids! Find lots more pictures of kids hairstyles, baby and toddler haircuts, short hairstyles for kids, funky and fresh hairstyles, and other style-errific Back to School haircuts on their kids hairstyle photo gallery! We're having a great day at Shear Madness, we hope you have one too! August at Shear Madness - We are your Back 2 School Hairquarters! August at Shear Madness - Our newsletter can also be found on our blog every month! Start this school year off right with one of the BEST looks ever from Shear Madness! Make your appointment early during the month of August (we will be busy!!) to get spiffed, styled, and stocked up on all the hair stuff you need for back to school..
We have plenty to choose from ~ browse TONS of pictures on our kids hairstyles gallery. Plenty of styles to choose from for boys and girls! Our Lee's Summit Model Search is over! All entries are in and 10 winners will be announced on our facebook page August 13th. CUTE Back 2 School Notebook DIY!! Our Semi Annual Bow Sale! Buy 2 Get 1 Free!!! Come in any time during the month of July and shop our extensive selection of hair bows, headbands, and hair accessories! This is the perfect time to Build a Bow!! Sale ends July 30th at participating locations, call your store for details! In celebration of July 4th we are giving RED, WHITE, AND BLUE HAIR STRIPES for FREE with the purchase of a haircut! Come in on the 4th of July and get spikey, starry, and striped up for the Independence Day Celebration! Also come paint your digits with festive nail Polishes and Pens ~ DIY Nail station rocks July 4th at any of our salons! Is your Child Model Material?? Our newest location at Summit Fair in Lee's Summit MO is searching for models and brand ambassadors! Kids of all ages are welcome - 10 Winners will be chosen for the next Shear Madness Model Shoot coming up this fall. You must enter the contest before July 31st Click here to enter now! Keep Blondie from Going Green! Hopping in and out of the pool is great for your tan but can be hard on your hair! Many blonde haired heads wind up looking greenish by this time in the summer. WE WANT TO HELP!! At Shear Madness we carry ALL the Circle of Friends hair care products, specially formulated just for kids! Try Emma's Pre-Swim Coconut Scented Conditioner, Kylee's Swimmers' Shampoo, Maya Papaya Conditioner, or Bonita’s Banana Spray in Detangler! If you have a severe green 'situation' ask your Shear Madness Stylintist about a Green Removal treatment. Follow Shear Madness on Pinterest too! Are you or someone you know interested in opening a Shear Madness? Now is the time Get more info on our franchise website. Our Winners for June were : Lori Perkins, Stacy Conner-Lankard, Nada Tabbakh, and Jamie Pannell ! Look for our Free Haircut Friday contest every Friday on our facebook page. June is Rock the Buzzcut! Summer is here and it's cool to get your BUZZ on with $11.95 Buzzcuts from Shear Madness!!! Rock the Buzzcut appointments must be made at least 24 hrs in advance. At participating locations in Kansas City ONLY Call now and schedule your appointment! This offer ends June 30th! Happy Father's Day to all our dads out there! It's such a fun time when dads and their dudes get spiffed together! That's why during the week of Father's Day June 9-16th we will be offering $5 off our Father Son haircut package! (reg price $29.90 prices vary slightly by location) SPECIAL DISCOUNT for father and sons this week ONLY! These will go fast so call now to make an appointment! Our newest location at Summit Fair in Lee's Summit MO is searching for models and brand ambassadors! Kids of all ages are welcome - 10 Winners will be chosen for the next Shear Madness Model Shoot coming up this fall. Click here to enter now! Our Winners for May were : Melissa Stephenson, Rosalee Forbes, Brooke Morales, and JasonJessica Laffler! Look for our Free Haircut Friday contest every Friday morning on our facebook page! Summer is Coming so Keep Your Cool! This month is an EXCITING one for Shear Madness and our families! School is letting out and one way to stay cool with the kids is a great summer haircut from Shear Madness! We have lots of stylish hairstyles to choose from for BOTH boys and girls - PLUS, have some fun and join us in Lee's Summit for our NEW Store's Grand Opening!!! Sunday, May 12th is Mother's Day and we will be CLOSED for business in honor of our wonderful mothers. Celebrate the holiday with us before or after with a SPECIAL Mommy and Me Spa Package for only $34.95!! Package includes a full Spa Pedicure and Mini Manicure for both Mom and Daughter ~ Mommy and Me is only available during the month of May. Please call your location to schedule an appointment. At participating locations only. Memorial Day Weekend we will offer a special 15% discount on all hair products and services for our military families. We appreciate all that you sacrifice and we thank you! ENROLLMENT for GROOVY GLAMOUR Classes start this month! Groovy Nails, Braids, and Dashing Space Hands for the Boys ~ These classes are a HIT with the kids AND moms! Each 2hr class provides guided instruction and demonstrations, a whole lot of fun, and each child receives a FREE GIFT plus 15% off any merchandise purchased on the day of the class!! Classes are reg. $40 now discounted to only $25! MUST mention the code word "BLOG" to receive the discount Find out more about our Groovy classes HERE, or call your salon for times and registration. COUPON Clips - Click HERE! to get exclusive deals! May 23rd - June 2nd come join us at the new Shear Madness in Lee's Summit, MO ~ There will be Prizes, Pink Starlets, FREE Glitter Tattoos, Haircut Specials and some AWESOME retail give aways ~ Don't miss out, we'll see you there!!! We are looking for cute kids of ALL ages with great personalities to enter the NEW Lee's Summit MODEL SEARCH! 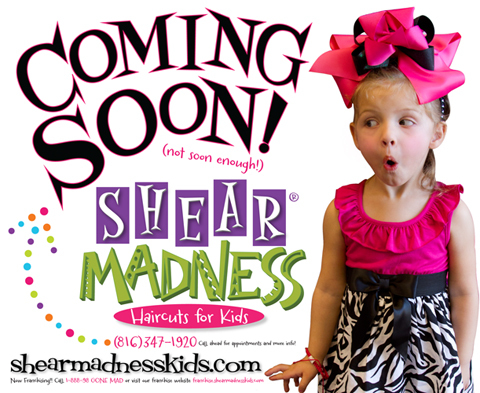 Submit your child's picture on facebook before July 31st and they could be a Shear Madness Madtastic Model! Ten winners will be chosen - 6 at large and 4 by us. Don't forget to refer your friends also or visit the new store and YOU will win EXTRA votes! Are you or someone you know interested in opening a Shear Madness? Find out how. Get more info on our franchise website. Our winners for April were : Suzanne Shyver, Christina Estes, Erin Racer, and Felicia Lawrence! You all have eight weeks from the date you won to redeem your free haircut at any of our salon locations! Participate in our Free Haircut Friday contest every Friday morning on our facebook page. One winner is chosen every Friday! SO MANY!! In the franchise world there are a plethora of options. Choosing between categories alone can be a challenge! However, one category that many times is worth evaluating is salon franchises. Why you ask? Well, everyone needs a haircut now and then. Most sectors of the salon industry are recession resistant, and it does not appear that the internet is going to be able to replace haircuts anytime soon! The choices for a Salon Franchise are bigger than you think! The ones everyone thinks of are some of the Original Hair Salon Franchises - think Great Clips, Fantastic Sams, Snip n' Clip, etc. These are low end walk in type salons. Clientele does not make an appointment and they tend to exist on every major street corner in most metropolitan cities. These typically have the stylists act as management as well and the owner is an absentee owner. Mens' salons - this niche is relatively new to the franchise sector. Probably the most well know mens salon franchise system is Sport Clips. However, many others have opened in recent years. Everything from very high end Men's Country Club type salons that offer a full array of services i.e. The Boardroom, down to lower end salons that do high volume yet still offer men a good haircut without all the frills. There are those that appeal to pool players and those that just cater to "players". Most wives don't really appreciate those and taking your kids to one is deemed "inappropriate"! Kids Salons - again we have a type of salon that is relatively new to the scene. There is no real dominant player in this arena. Shear Madness Haircuts for Kids has been in operation since 1997 and that is one of the earlier children's salons. None of the salon systems predate the 90's! Each franchise has its own personality and philosophy on running a succesful salon. Extras added to some are kids retail and birthday parties. Some are run by a manager and others have the stylist/manager configuration. A close evaluation of what makes up te revenue portion of the salon is important to look at. How easy is that portion to run? Does it take an onsite owner or can it be run absentee? Hair Removal Salons - these are also very new to the franchise arena. Tropical Laser Hair Removal opened in 2007! They still fit under salons as the technicians need to have licenses just as hair stylists need to have licenses. These can be combined with the above types of salons or can be a stand alone type. Many times these are partnered with businesses offering massages. Nail Salons - there really is not a dominant player here at all. It seems that most nail salons are individually owned, yet we are waiting for a franchise to pull it all together! Massage Salons - think Massage Envy. These typically sell memberships as opposed to collecting revenue when the service is actually performed. This type of franchise with membership fees is very popular especially in the health club arena. Many buy memberships and then do not use them like they should making the franchise system more profitable. There you have it! Lots to choose from! Which one is best will depend a lot on your specific situation. • Are you located in an area that already has enough of any one of these types of salons? • Do you want to work in your salon or run it absentee? • How much income are you hoping to generate on your salon? • How many salons can you afford to open? • How much support does the franchisor offer vs. how much you need? • How does your talent set match with that of the franchisor? Meaning - are they going to provide what you lack? If you are thinking I want to know more about franchising in general we invite you to download our Free Toolkit and find out what the Top 4 Condsiderations are when looking for a franchise! Once you know a bit more about investing in a franchise in general you will be more prepared to contact individual franchisors and ask great questions! April is a Fiesta at Shear Madness! This month CELEBRATE fiesta month with your friends! During the month of April EVERY party booked you will SAVE $50 when you mention this offer!!! Check with your participating salon location for dates, service, times, and availability. We can only schedule parties up to six months in advance for our customers, offer valid for parties of 10 or more. Check out our Great Groovy Glamour Classes for Hair Braiding and Nails! This month we will kick off Spring right with our Groovy Hair and Nail classes. This is a fun way to spend an afternoon with your special girls! Our stylists will teach different braiding, hairstyling, and fingernail care techniques and each girl will leave with a fabulous style they can then do at home. Sign up sheets will be in the salons or call your salon for days, prices, and class registrations. Classes and times may vary, check at our participating locations! We had such a great and memorable time with you and all your families at the Shear Madness Photo Shoot March 3rd 2013 in San Antonio, TX. Start looking for your pictures on our website, facebook page, twitter, pinterest and other Shear Madness advertising! SPECIAL DISCOUNTS from Local Friends of Shear Madness! These are some of our most favorite local businesses who have partnered with us to increase exposure, awareness and build quality clientele! If your business is interested in an advertising partnership with Shear Madness then WE WANT TO TALK WITH YOU! Are you or someone you know interested in Opening a Shear Madness? Now is the Time! Get more information on our franchise website. Our winners for March were : JJ Jones, Rickesha Wright, Susan St. John, and Aileen Wiggins! Look for our Free Haircut Friday contest every Friday morning on our Facebook page!